Every roman has been to St.Peter’s at least once in their lifetime. Some people may have gone there on a school trip. Some people have been there to see the Pope. Some people go there on Christmas day or Easter Sunday. And some other people happen to go with friends or family from out of town. Whatever the reason is, every time is like the first time as we stand in awe as soon as we step into St.Peter’s Church. The Church huge colonnade embraces us. The Michelangelo’s Pietà can overwhelm us with emotions. And finally, our gaze is captured inevitably by the magnificent Cupola. Meet the Pope. If you happen to be in Rome on a Wednesday you have the chance – for free - to see the Pope address the audience from the balcony. The so-called general audience. All you need to do is register on the Vatican Website, download the form, fill it out and fax it. Once you’re registered you have the right to collect your free tickets at the office c/o the Paolo VI hall (right colonnade on the square) from 3 pm to 7 pm of the day prior to the general audience or on the morning of the general audience from 7 am to 10 am. If the Pope is in Rome on Sunday, he blesses the worshippers from the balcony in St.Peter’s Squadre at 12 pm. No ticket is required to see attend the Sunday audience. Look at the columns perfectly aligned. There are two spots in the square from which you can see all the columns perfectly aligned. These two spots are located between the middle obelisk and the two fountains. They are indicated by two iron circles on the pavement. The Michelangelo’s Pietà. As you see the altar, on the right aisle, located in the first chapel is Michelangelo Buonarroti’s Pietà. It’s an early work, carved in 1499 when the artist was just 24 years old. It’s a can’t-miss masterpiece. Skip the line: Chances are that you’re going to be in line for a very long time to enter the Church and walk up to the top (the Cupola). So arm yourself with patience and try to pick the shortest queue. If you want to avoid the line to the Sistine Chapel you can do so by booking the all-inclusive ticket. This ticket also includes access to the Vatican Museums as well as the Cupola. You can log on to the Vatican online ticket office and book the single entry as well as a guided tour. You’ll need to enter the exact time of your visit. This tour starts with the Vatican Museums and finishes at the Sistine Chapel. The ticket is valid for one day only and can be booked from up to 10 to 60 days prior to the visit. If you have no way of booking online, try to show up at lunch time as the lines usually shorten up. “Dress Code”. In churces access is forbidden if your arms and legs are not properly covered. Even more so in St.Peter’s Church. Pants or long skirts are required to get in. Your shoulder also must be covered. Otherwise you will be denied access to the Church. Imagine being in line under the scolding sun for 2 hours and then not being able to get in! So trust us, follow the dress code and you won’t miss out on all the art that is hidden into the thousands of Churches of Rome. You can take the elevator - and save yourselves 200 steps - to get to the top of the Sistine Chapel. In any event you will have to walk more than 300 steps anyway to get up top. The higher you get, the narrow the staircase gets and you may end up walking up “bumper to bumper” with the other tourists. So you better dress comfy – especially the shoes - to face the challenge. Separate entrances. The St.Peter’s Church, the Sistine Chapel and the Vatican Museums have separate entrances. The entrance to St.Peter’s is on the north side. The entrance to the Sistine Chapel and the Museums is at Viale del Vaticano n. 100. You could access the Church from the Sistine Chapel, but access is limited to guided tour groups. St. Peter's Baldachin. 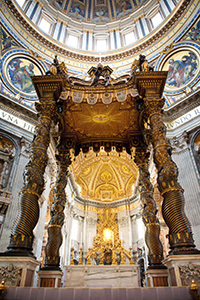 The large baroque sculpted bronze canopy right in the center of the Church was built by Gian Lorenzo Bernini. But also Carlo Maderno and Francesco Borromini worked on it. During the summer, bring a hat because the sun is hot (once you get in the Church you will be ordered to remove it so it has to go in your knapsack). And of course, don’t forget your camera because the view of Rome from the Cupola is absolutely breathtaking. The Church is open from 7 am to 6:30 pm from October 1st to March 31st and from 7 am to 7 pm from April 1 to September 30th. 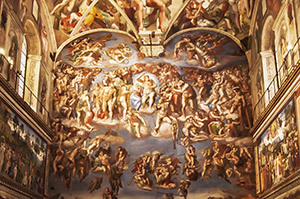 The Sistine Chapel is open from 8 am to 5 pm from October 1st to March 31st. And from 8 am to 6 pm from April 1st to September 30th. Access to the Church is free of charge. To get in the Sistine Chapel the charge is 6 Euros if you go by foot (551 steps) or 8 euros if you use the elevator up to the balcony level. (In the latter case you’ll need to walk 320 steps to get up to the Cupola anyway) The all-inclusive ticket that includes the Vatican Museums is 16 Euros and allows you to skip the line to the Sistine Chapel. Subway: This is the fastest way to get to St.Peter’s. Take the A line and get off at Ottaviano-San Pietro station. Bus: You can take the bus n. 40 or 64 from Termini station. Or the n. 492 that goes from Tiburtina Station to the center of Rome.